I am excited that Nic Howard will be teaching another class at Big Picture Scrapbooking. This new workshop is called Colour! Or Is It Color? It is a 6-week workshop beginning October 28. (Registration is still open if you're looking for a great class for the fall!) For the pre-class assignment, we received instructions to make six color tags - one for each color of the rainbow that we will be studying during the workshop. These tags were fun to make and I'm looking forward to learning how to better use color in my scrapbooking when the workshop starts next month. Listening to an episode of the Paperclipping Roundtable﻿ a few days ago, I was inspired to start a mini-album documenting our Do-It-Yourself projects. I purchased a denium covered 8x8 Paper Studio post bound album to house these layouts and plan to embellish the cover. I am going to include two-page spreads highlighting items that Robbie and I have made or frequently make. Here is my first layout, highlighting the diaper cakes that I make for baby shower gifts. I used DCWV Matchmakers Scalloped cardstock for the background, cut my letters using the Makin' the Grade Cricut cartridge, copied and reduced the diaper cake "recipe" and added a journaling block. I'm off now to browse a few blogs and scrapbook galleries in search of inspiration for my next layout! Yes, as I continue to focus on being aware of what I'm learning each day for the Learn Something New Every Day class, I realize that I miss blogging. I miss recording what's happening in my life, sharing my latest layouts and book reviews, and journaling my thoughts about various subjects. I miss the encouragement from comments and the accountability that pushes me to stay on track with my healthy lifestyle changes. My good intentions to continue journaling have not come to fruition; just isn't as much fun without the photos and an "audience" to write for. My Learn Something New Every Day album is coming along nicely, although I changed the format along the way. I'll be sharing some pages (and maybe the completed album) here on Wednesday. It has been almost six months since I decided to try something new and began this blog as "a place where I could share what's happening in my life, post photos (including my latest scrapbooking pages), maybe even offer advice or inspire someone with my ramblings about books I've read or my latest organizing project." As I bring this six-month "experiment" to a close, I must admit that I have enjoyed it and have learned a lot about the blogosphere. My favorite aspect of blogging is the regular habit of journaling about life as it happens. I plan to continue the practice of journaling using my computer as well as a print journal. I especially enjoy being able to refer back to what I've written when I need journaling for a scrapbook layout. I want to thank each of you for stopping by and reading my blog. And a special thanks to those of you who have taken time to comment, especially Sue whose regular comments have been a great encouragement and whose blog continues to showcase scrapliftable layouts! As we settle into the new routine of fall, I will be busy with a new weekly Bible Study, Church Care Group meetings, the monthly library book club, volunteering at our local community outreach, conducting storytime in a friend's 2nd grade classroom, preparing for the upcoming holidays, continuing to work toward a healthier lifestyle with good eating habits and regular exercise, and (of course) scrapbooking/preserving memories and maintaining our happy home. As I've continued to read/work through the material for the free Start Here With Stacy class, I've completed several layouts in the past couple of days. There were seven challenges plus a bonus idea in the class. I completed layouts for five of the challenges (the first of which I described in an earlier post). I had actually created layouts for two of the challenges earlier this year when I first signed up for the course, however I created new ones this week also. The other two challenges involved mini-album projects which I don't have a need for right now based on my unscrapped photos. The bonus idea is about Stacy's Scrap by Color system, which I've already implemented and will be sharing more about soon. The second challenge involved choosing a heritage photo that I don't know much about, then browsing the BPS galleries and scraplifting a layout idea. Earlier this year I completed a layout with a heritage photo of my grandfather (you can see it here in this post). This week I pulled a photo of my Mama when she was a young girl with her Mama (my Grandmother). I scraplifted the layout design from a layout by Wendy Rose in the BPS Dimensional Details gallery. The next challenge was to select just 3 or 4 photos from a destination and put together a simple layout. Earlier this year I created a layout about our visit to Eisenhower's Birthplace. My favorite part of this layout is Robbie's contribution - when I showed him the original layout he mentioned that it would be neat to add five stars to the layout because Eisenhower was a five-star general. Thus, the stars at the bottom of the layout. This week I pulled three photos from some new prints I just received this week and created a layout showcasing these photos at Mount Rushmore. I had purchased this Mount Rushmore patterned paper at our local scrapbook store a few days after we returned from out trip, andI cut the titles letters out with my Cricut. One of my favorite of the challenges was the one to create a vacation layout without photos, using journaling to recreate the experience and describing the emotions evoked. I already knew I wanted to write about our drive through Glacier National Park, so this layout came together fairly quickly. The last of the challenges that I completed involved creating a photo-collage layout filling in any gaps with patterned paper and adding a few embellishments. I pulled photos from behind the Cooking tab in our Activities We Enjoy category drawer and created this easy layout. The photos range from 2002 to 2010. I really like that this class inspired me to complete such varied layouts and to capture the extraordinary as well as the ordinary events in our lives. This past week has been a good one for me as I continue working toward a healthier lifestyle. My primary focus for September is getting back into the habit of exercising regularly. My goal for each week is to ride the stationary bike for 30 minutes five days, complete a 30 minute strength training routine three days, and go for a walk or bike ride or other outdoor activity one day. This past week I accomplished all of these goals. I am riding the stationary bike on level one (the "easiest" as far as pedaling is concerned) and have been averaging a little over 10 1/2 miles each day. I used ten pound weights for my strength training routine twice and the third time this week I used the ten pound and twelve pound weights, first set with the 10 pound and the second set with the 12 pound. [Next week I'll outline what I do for this 30 minute routine which really includes strength training, flexibility, and stability exercises.] Overall I did well on my eating this past week. I am not tracking what I eat and drink right now as I want to focus on re-establishing my exercise habit. In October, I will be focusing more closely on what I eat. 2. I haven't finished everything else on my to-do list yet. 3. It's too late in the day now and exercising will keep me awake. 4. I just don't feel like it! 10. There's too much pollen in the air. 11. We are on an orange air quality alert. 12. I need to vacuum the carpet before I do floor exercises. 14. I don't want to be off in the other room instead of in here hanging out with Robbie. 15. We have company coming later (today, this week, this month) and I don't want to get my exercise equipment out. 16. I am inspired to scrap a layout and really need to act on the inspiration right away! Have you used any of these excuses? Do you have other excuses that you use? After this past week of regular exercise, I must say "watch out for my dynamic and creative intellectual activity!" :>) No more excuses! I created a layout today based on the first challenge in Stacy Julian's Start Here With Stacy free class at BigPicture Scrapbooking.com. I originally signed up for this class at the end of last year when I first discovered the BPS site. I read all the material at that time and created a few layouts. I decided today to go back and work through the challenges in this self-paced class. The first challenge is to "create a layout that features at least three photos (taken at different times) that illustrate a particular personality trait in someone you love." A few months back I had created a Story Card with an idea to create a layout about Robbie and the things he's built, repaired, and maintained. I love that he is so handy around the house and can often turn the vision in my head into reality - like the sketch I drew of a bookshelf unit for our paperback books. I pulled photos from 2002, 2008, 2009 & 2010 for this layout. The actual page layout itself is a scraplift of Stacy's example layout in the class. I used two patterned paper scraps to pull the two pages together. I paired old and new items for this layout. The saw and hammer die cuts have been in my stash for probably ten years while the Tim Holtz sprockets are items that I purchased a few months ago. I also included a non-scrapbooking supply, if there's such a thing! (I personally think anything that will fit on a page is fair game for a layout.) These letter tiles came from a travel hangman game. I organized/decluttered our game shelf earlier this week, and I discovered that the plastic hangman case was broken and could no longer be used. The case went in the trash, but these letters made their way onto my scrapping table! I am so excited to have documented Robbie's handyman talents in this layout. The challenge for September 5 was to include a flower motif on the page, so I added two Prima flowers and several stamped flowers to my page. September 5 - Today I learned: I can appreciate the luxuries of our church, worship without inhibition, and stand in awe of how God answers prayers IF I think about the church building we are helping to erect in India and the congregation that has been meeting in an outdoor veranda for five years! The I can give God all the glory for allowing us to be part of answering the prayers of that congregation. The September 6 challenge was to "take inspiration from the cover of a book." I decided to "copy" the cover of my favorite recipe book since my lesson was about a new way to cook ribs. September 6 - Today I learned: I can enjoy crispy-on-the-outside, tender-on-the-inside delicious ribs IF I season the ribs, bake them in the oven for several hours, and then place them on a hot grill and slather them with barbeque sauce. The Try Something New prompt that I drew for my September 3 page read: "Use pop dots or foam tape to give elements dimension." I used two pop dots for the flowers at the top of the page and a foam strip for the tag on the right side of the page. September 3 - Today I learned: I can exercise five days in a row, riding the bike 30 minutes at a time, and adding in a 30 minute strength training routine three days IF I make it a priority everyday and do not get discouraged. I will eventually reap the benefits of feeling better and losing weight. The Try Something New prompt for September 4 was "give your entry wings: include a bird, a butterfly, an angel or something else in flight." Since my lesson included regular Quiet Time with the Lord, I included several angel stickers in my layout. September 4 - Today I learned: I can accomplish more in the mornings, ensure that I don't skip my Quiet Time with the Lord, and begin my day on a positive note IF I shut down the computer at night and complete my morning routine before booting it up in the morning. Then I can check email and read blogs and forums without feeling guilty that I didn't take care of the important things first. I really didn't start the month out planning each lesson to be an "I can . . . IF . . ." statement, but after the first few days, I like the way it's turning out. Have you noticed the variety of colors on these pages? I'm doing something totally different than my usual get-everything-to-match-and-look-just-right scrapping. Each day I open the same template from Shimelle and then pick three papers from the class kit, starting with the paper number for the date and then choosing the next two also. The first color is the background of the template, the second color is for the flourishes, and the third color is the photo border. This is resultings in a variety of color combinations, and I have to admit that I'm just having fun with it! Robbie and I are so excited that we can be a part of something great that is happening in India - a new church building is being erected! Robbie and I have been financial and prayer partners with Christ for India for the past eight years. Among other things, Christ for India trains Indian nationals to become pastors. 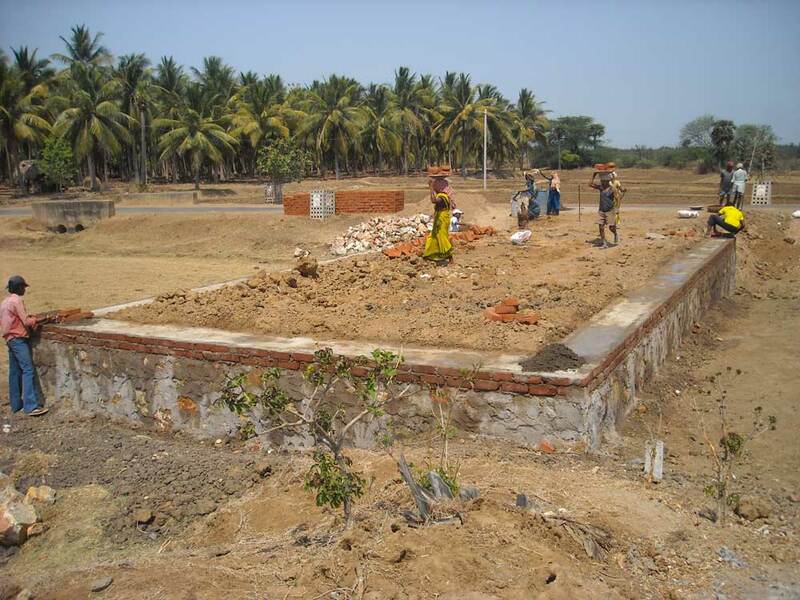 Many of the Christ for India seminary graduates have established church groups throughout India, however these new congregations rarely have funds to build a church building. Robbie and I are excited that because of God's blessings in our lives, we have been able to help with the construction of a church for Pastor Prabhudas in Savara Villi, Vizianagaram Distrist, Andhra Pradesh State, India. This congregation of men, women and children has been meeting weekly in a veranda of one of the member's home. We received these photos of the new church building several weeks ago, so it's possible that by now these new walls are resounding with praise to our Savior. Maybe there will be wooden benches in the room, but more than likely everyone will stand or sit on the floor. I pondered this as I sat in our air-conditioned, carpeted, nicely decorated church with cushioned chairs, a worship team, and PowerPoint slides to help me follow along with the pastor's sermon this morning. I contemplated how it is often difficult for me to allow myself to worship fully, wondering who might be watching me or if my hair is out of place or if there are any scuffs on my shoes. Yet, in India - a country where Christians are still often persecuted for their faith - these men and women worship in an outdoor veranda, without shoes or inhibition, praising the same God! We received a letter from Pastor Prabhudas who says: "In the year 2005 I pioneered a church at Savarvilli village. 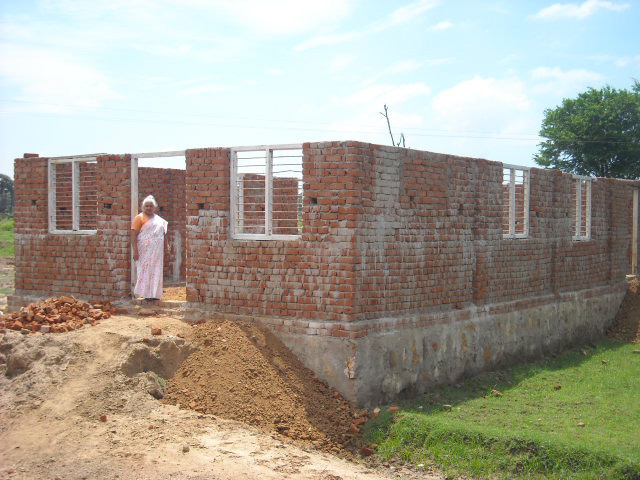 We have 20 believers worshipping in a varanda of a house. We have been praying for a church building. Thank you for building us a place for worship. We pray for you. God Bless You." I stand amazed that God used us to answer the prayers of Christians we have never met. Today I want to give God all the glory for the construction of this church building. It is His provision and the faith of the believers in this congregation that has enabled this new place of worship to be built in India! My prayer now is that God will allow us someday to travel to India to see this church and worship there. I wonder how it will feel to worship in a small building without air-conditioning and cushioned seats? I wonder if the members there will be able to see the light of Jesus shining in my life? I wonder what lessons God will teach me there? Started a Word file for my Christmas letter this week, just typed a few little bulleted items I want to remember to include in the letter. I remembered I had some Christmas stationary sheets in with my scrapbooking supplies and I pulled those out and put them in my Christmas file to use for this year's letter. I went shopping this week and purchased the few supplies I need for the Christmas gifts I'm making. I also purchased the gifts that I'm not making. I have all these items stored on the Christmas shelf and planned on my calendar days to work on the items I'm making. This week's room to work on was the office/craft room. I moved my office/craft room to a new room back in November of last year and did a pretty good job of organizing everything at the time. Since then, I completed the Library of Memories workshop and re-organized my photo and memorabilia storage - you can read about my new system in this post. A couple of months ago, I also re-organized some of my scrapbooking supplies by color. I am very pleased with the set-up in this room, so I didn't do much in here this week except pick up and put away all the little piles of things that tend to wind up on the floor when I'm working on several projects at a time! I also worked more this week on my computer network set up: deleted all my files from the old computer, uninstalled programs from the old compter and wiped the hard drive clean, downloaded/installed programs on new computer. I still have a few things to go on this project, my goal is to be done by the end of the day on Monday. Completed the first two pages for my mini-album for the Learn Something New Every Day class. For my pages, I am first creating a 3" x 4 1/2" lesson block using Shimelle's digital template and papers. I'm including a photo and my lesson for the day. Shimelle also provided us with Try Something New prompts for each day to encourage us to try something new with our scrapbook pages. I cut the prompts up, folded them and put them in a bowl so that each day I could draw a new one as I started my page. For September 1, I started with my blank page, the printed lesson block and a Try Something New prompt that read "cut a variety of circles by tracing around items in your kitchen." I picked four patterned paper scraps and traced around several items in the kitchen. Then I cut out the circles and inked the edges. I ended up adhering the circles randomly on the page, adding my lesson block and then adding some circle rub-ons that my sister sent me for my birthday. I have not had great luck with rub-ons, however Robbie had gotten me a new rub-on tool for my birthday and it worked wonderfully. Here's the completed page. September 1 - Today I learned: I can scrub both bathrooms, feather dust every room, vacuum all the carpet, and sweep all the flooring in the entire house in ONE HOUR IF I don't take any phone calls (or otherwise get distracted)! Thus leaving more time for the fun things on my to-do list! For September 2, my Try Something New prompt read "close your eyes and pick a piece of paper from your scraps as your starting point." Since all my scraps are organized by color in page protectors, I chose my blacks and oranges, closed my eyes and chose a patterned paper in each color to create this layout. September 2 - Today I learned: I can set up a new desktop computer, set up a wireless modem/router, install new software and printers, and completely erase the hard drive in the old computer IF I take it step by step and have lots of patience. And I can enjoy it all now that it's working properly! Over the past four years or so, I have struggled with my physical health, my weight, my energy level, and my emotional health. Before that time I was typically happy with my weight and overall health. This month I am renewing a commitment to living a healthy lifestyle and thought I would start a weekly post with my thoughts and progress. I want to share a little of my story as I begin this weekly healthy living post. Four years ago I began to gain weight and started feeling tired all the time. Since I was teaching 8th grade, completing the final classes for my master's degree, and presenting my research at a couple of professional conferences, I just assumed I was exhausted as a result of my crazy schedule. As it turns out, my thyroid was the culprit! By the time we moved back to the Dallas area in the spring of 2007, my thyroid was being regulated with medication and I decided it was time to lose weight and get healthy. I visited a dietitian and started monitoring what I ate, drank only one Coca-Cola a day, and exercised regularly. Over the course of several months, I lost weight and felt great. Robbie and I had decided to start a family, however that did not seem to be God's plan for us. After a year and a half we had not gotten pregnant and went through the process to adopt a child. The process of getting licensed to adopt, being matched with a child, and all the ensuing paperwork and stress took a toll on me. We actually had a disrupted adoption - which basically means that the adoption did not happen. The decision not to adopt was one of the most difficult decisions we have ever made. Throughout that year-long process I felt a lot of stress in my life and I gained all my weight back (for the first time in my life I truly understood the term yo-yo weight loss!). At the end of last year, right after the disrupted adoption, I was emotionally spent. In January, I enrolled in a two-month long BPS class called Wellness Journey, taught by Lisa Cohen. During those two months I did fairly well with regular exercise and tried to add more fruits and vegetables (and less sweets) to my diet. The daily check-in with other classmates helped keep me somewhat on track, but I was still dealing with a lot of emotional hurt and have not kept up with the exercise and healthy eating over the past six months. I have to say that the class was excellent and Lisa focused on living an overall healthy lifestyle. In fact, this week I've started re-reading the material from the class as motivation and am planning to take the class when it is offered again at the end of the year. I have felt God's healing in my spiritual and emotional life and the past few months I have been at peace, relaxed, and enjoying life. I set September 1 as my start date, and I go back in for a check up the week before Thanksgiving. My goal is to have my cholesterol down to an acceptable level by that time. I am going to be focusing on an overall healthy lifestyle including physical, emotional, mental and spiritual health. I'll check in here each Friday to give myself some accountability. I actually started working on my exercise goal this past Monday. So far this week I have ridden the stationary bike for 30 minutes four days and completed a 30 minute strength training routine using 10-pound weights two days. Next week I'll update you on my progress and share with you some of the excuses I use to avoid exercise on any given day. It's been a busy week, and yesterday I just wanted to scrap! So, I took a minute to put together a quick layout. This layout was inspired by Stacy Julian's bonus project at the Big Idea Festival. She created a simple page titled Jump with a series of photos of her daughter jumping on a trampoline. I took the series-of-photos idea and used it to create this simple layout of Andrew on the slide at the mall playground. So much fun to throw together a quick layout! I didn't really work on decluttering a specific room for week two, rather I took the week to set up our new computers. So far, I have the new desktop up and running (although I still need to install/download three programs), the new modem/router is set up and working, and the new laptop is working (although there is a glitch in the webcam and we may have to exchange it in a few days and start over with the set up). I still have more to do on this project - will be working on installing the other programs and getting the external hard drive set up tomorrow. I did take a half hour today and straighten the closet in my office/craft room. I actually decluttered/organized this closet a few months ago as recorded in a previous post, but since then I had set a few items in the closet floor thinking I would put them where they belonged "later." So, today I put those items up - a new wrapping paper bin that replaced the old shredder base in the corner of the closet to hold wrapping paper and shipping tubes, Christmas paper and bags that I picked up at a garage sale went in the attic with the other Christmas wrapping supplies, and empty storage containers (bins, baskets, etc) went on the shelf in the garage where I keep these items so when I need a container while I'm organizing I can check and see what I have before buying something new. So, that closet is back in tiptop shape. I also made a list of future projects I have stored in the closet. I added these to my craft projects/ideas spiral where I keep a list of projects I want to do. I'm trying to get in the habit of checking the list when I make my plans for the week so that I can work on these projects when I see that my schedule permits.